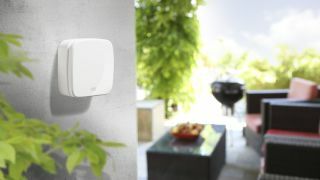 Elgato has announced that Eve, the company's range of sensors used for monitoring your home, will be coming to the UK in July. If you're interested in transforming your house into a smart home, keep reading for a full rundown of all the products Elgato will be releasing. The sensors make use of Apple's upcoming HomeKit app, which will allow you to control multiple connected devices from a single app. "HomeKit offers a simple, convenient and secure solution without monthly fees or the need to purchase a starter kit," says Dr Markus Fest, CEO of Elgato. "This is the beginning of something big, and we're thrilled to be part of it." The company first demonstrated Eve at CES 2015, using Bluetooth LE rather than Wi-Fi. This means it won't require a central hub, reducing the stress on your Wi-Fi router, which we think is pretty smart. Sitting at the top of the range is Eve Room, it's an interesting device that will monitor air quality, temperature and humidity. It'll even tell you if your carpet smells, so maybe it's time for a hoover? Eve Door and Window, as the name suggests will allow you to check the current state of your entrances and exits. This is particularly useful if you're forgetful and frequently leave the house open to criminals. Eve Weather is, as the name suggests, a little box that monitors the weather outside your home. It'll record temperature, humidity and air pressure. Finally, there's Eve Energy, which will record how much energy your appliances are using, and allow you to switch them on or off remotely. Again, great if you're forgetful and frequently leave lights or – even worse – hair straighteners turned on. The devices will be controlled from an iPhone, iPad or iPod Touch (running iOS 8.3 or above), and you'll need to download either Elgato's Eve app, or use Apple's HomeKit app when it launches later in the year. Pricing of the Eve range begins at £34.95 ($39.95 US) for the Door and Windows, and rises to £69.95 ($79.95 US) for Eve Room. They will appear in Apple's Online Store this July.